I love everything ‘wedding’ and have since I was a little girl! I love to find what the latest trends are in the wedding industry. Whether it is browsing the web, skimming through fashion and bridal magazines, or watching any of the wedding television shows, I am always trying to find something new and hot! From a pharmacy technician to a wedding event coordinator. How did that happen? Seven years ago I married the love of my life and was working for a pharmaceutical company. A year later, I got inspired by my good friend, Summer McLane to get into the wedding industry. I had planned our wedding and have always planned family parties, graduations, birthday celebrations, and baby showers. I had never thought about planning events as a career. I took a “wedding as a business” class at a local college and from there immersed myself into the industry. I worked with the biggest wedding and event coordinators in Southern California and learned everything I could about coordinating a wedding. I even had the opportunity to make an appearance on the television show, “Whose Wedding is it Anyway?” on Style Network. My passion in creating wedding events led me to start my own company, Perfectly Made Weddings in 2007. When I am creating and planning the perfect wedding event, I am continually finding new trends and becoming inspired. During the slow wedding season when I am not planning or creating, I look for the hottest wedding trends. 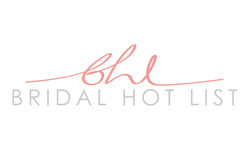 To stay connected to the hottest trends and share them with others like me that love this industry, I started Bridal Hot List. BridalHotList.com is THE resource for today’s bride, providing the hottest trends in the wedding industry. This site covers floral, invitations, reception and ceremony styles, cakes, bridal gowns, bridal hairstyles, and pretty much anything that has to do with weddings. Bridal Hot List features fabulous vendors such as photographers, venues, florists, and much more. Popular wedding television shows such as TLC’s “ Four Weddings” have also made it to the site with sneak peaks each week. Bridal Hot List is updated every day with a hot new trend or inspiration. This allows the readers to have something new and fresh when they check in. Bridal Hot List launched in September 2012, and is quickly growing every day. With readers from all around the country to other parts of the world, it has reached many brides, grooms, and wedding junkies. Bridal Hot List will keep today’s bride up to date with the most recent wedding trends.